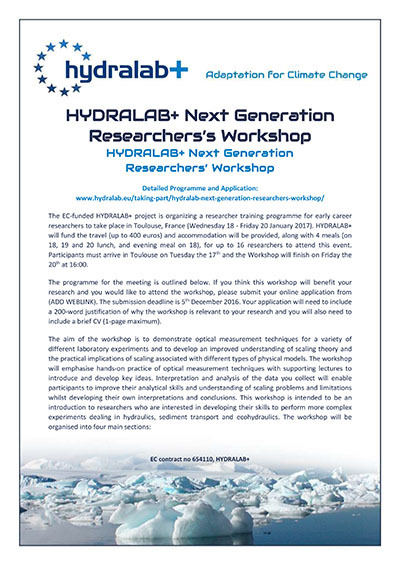 HYDRALAB+ is providing an opportunity for PhD students and Early Careers Researchers to participate in a workshop on Scaling issues in hydraulic models and optical measurement techniques. The workshop will include presentations on scaling and optical methods for measurements in fluids. Participants will get hands-on experience with different measurement techniques in four different laboratory experiments and will learn how to process and analyse data before present their results and interpretations. The workshop will take place at IMFT (UMR 5502), Toulouse, France on 18-20 January 2017. The techniques covered during the workshop will include: 2D-2C Particle Image Velocimetry, Laser Doppler Anemometry, Ombroscopy, and Altimetry using fringe projection. If you are interested in participating, please apply by 5th December 2016 using the application form at the web address below. The cost of accommodation and some meals will be included and there is funding available towards travel costs.